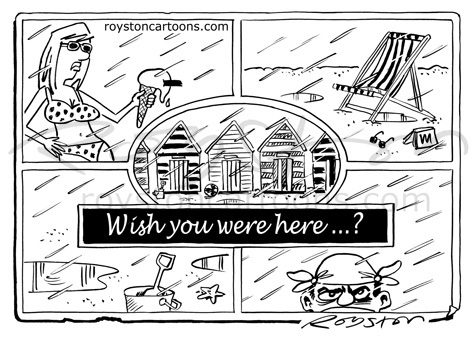 I've got three cartoons in the exhibition Animal Crackers, which opens at the Cartoon Museum in London today. Go see it if you're in the city this summer, it's funnier than the Olympic Games. I was chuffed that my penguin and polar bear cartoon was used on the invitation to the private view, above, which I attended last night. 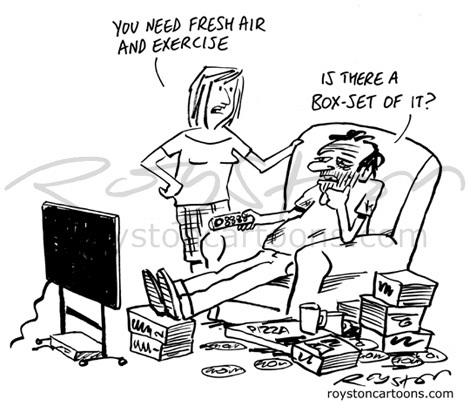 For a cartoon that I had zero expectation for when I drew it in 2006, it seems to have taken on a life of its own. It was originally in Reader's Digest, then it went on an expedition to the Antarctic, and later was used on a fundraising T-shirt for a bipolar disorder charity. 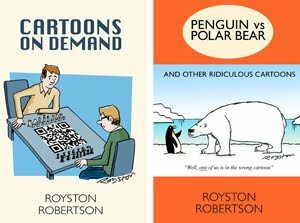 I've also used it myself as a business card, a Christmas card and it gave me the idea to do a Pengiun Books spoof for the cover of my book of cartoons. And throughout its many incarnations, I continue to hear of some people saying they don't get it. Which is fine, you can't please all the people all the time. 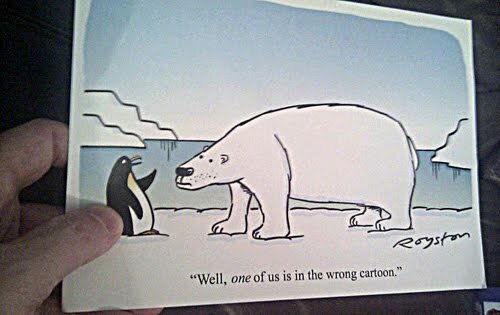 I myself don't know the answer to one question: which one is in the wrong cartoon? Footnote: The Animal Crackers exhibition is divided into themed sections. This one is in the Polar Opposites section where I was pleased, and a little humbled, to see it alongside this masterful piece by Mike Williams. 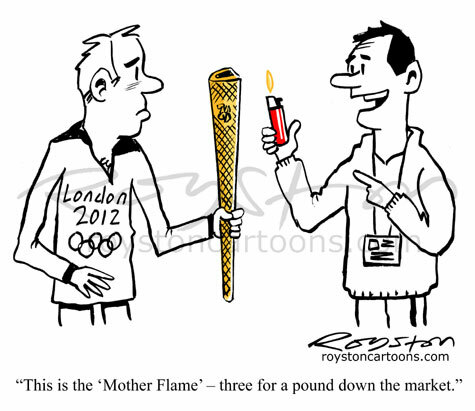 "This is the 'Mother Flame' – three for a pound down the market." This is a rejected Olympic Torch cartoon. Too cynical? Maybe, but cartoons don't really work when they celebrate something. Or they are not funny, at least. 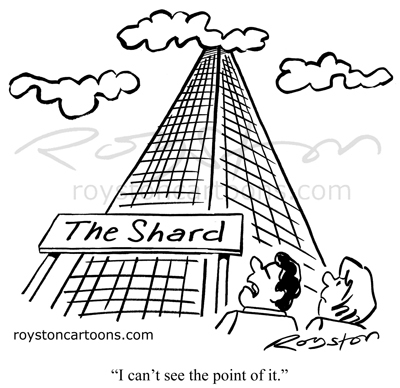 Cynicism is kind of the default position for cartoonists. The Torch came down our way this week, just a couple of streets away, so I popped out to see it and posted a rubbish photo of it on Twitter. 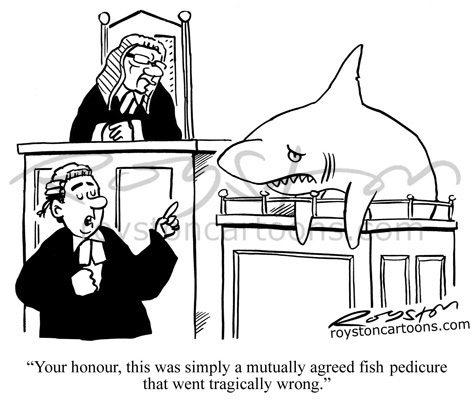 "Your honour, this was simply a mutually agreed fish pedicure that went tragically wrong." I drew this cartoon last year, when fish pedicures were all the rage, among people who go for that kind of thing anyway. Are they still popular? I've no idea. It's probably become a retro thing already. Anyway, this can be seen in the current Saga magazine. 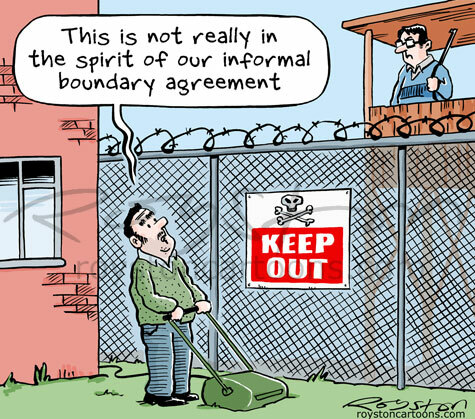 This cartoon was commissioned to accompany a law magazine article about boundary disputes. Taking things to a ridiculous degree is always a good way to get a joke out of something.